So, I’m not Spanish, or Latina, or of any ethnic heritage that makes me qualified to offer up a self-made beans and rice recipe. But this meal sure satisfies, and it’s about as simple as a complete meal gets. It’s filling, delicious, and basically nutritious. Besides, my husband loves it and sometimes that’s all that is necessary for something to make it into my regular repertoire. 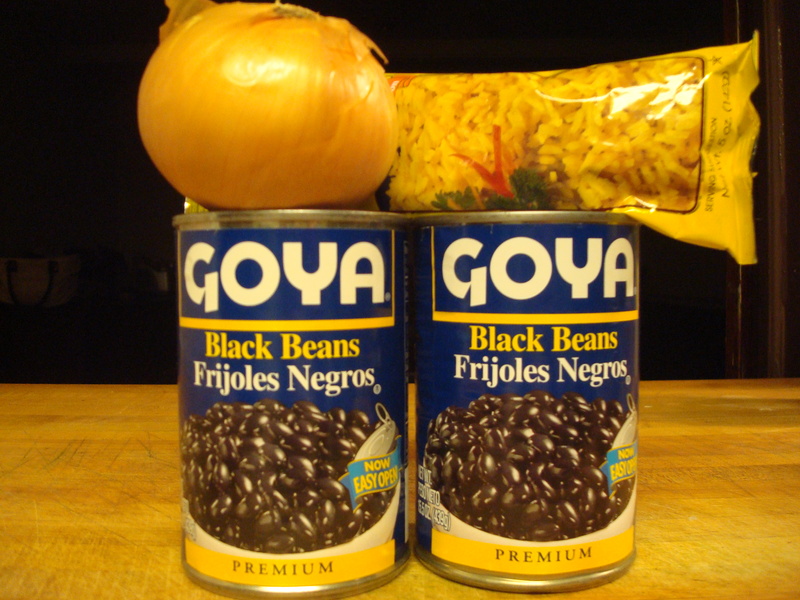 Ooh, and it’s versatile too… you can use red beans or black beans, which ever you prefer or happen to have on hand. It’s equally yummy. Of course, as far as the “foodie” in me goes, it’s not so elegant, fancy, or much to write home about. But the “formerly fat” part of me loves this meal because I can feel full after eating it and not have to feel too worried about it ending up on my hips. Ok, so yes, there IS bacon in it, but come on… I never claimed to be perfect. To make the rice follow the package directions. To make the beans slice the bacon into small pieces and put into a large skillet with the onion, diced. Over medium heat allow the bacon and onion to cook until the bacon is crisped and the onion has gotten soft and browned. Drain the excess oil leaving approximately 1 tbsp in the pan. Drain and rinse one can of beans and place in pan. Then drain the top liquid off the second can but do not rinse out the starch from the beans. Add those beans to the pan as well. Stir to mix with the onion and bacon. Toss the spices on top of the beans and mix to combine. Add ½ of the chicken stock and turn the heat up to medium/high. 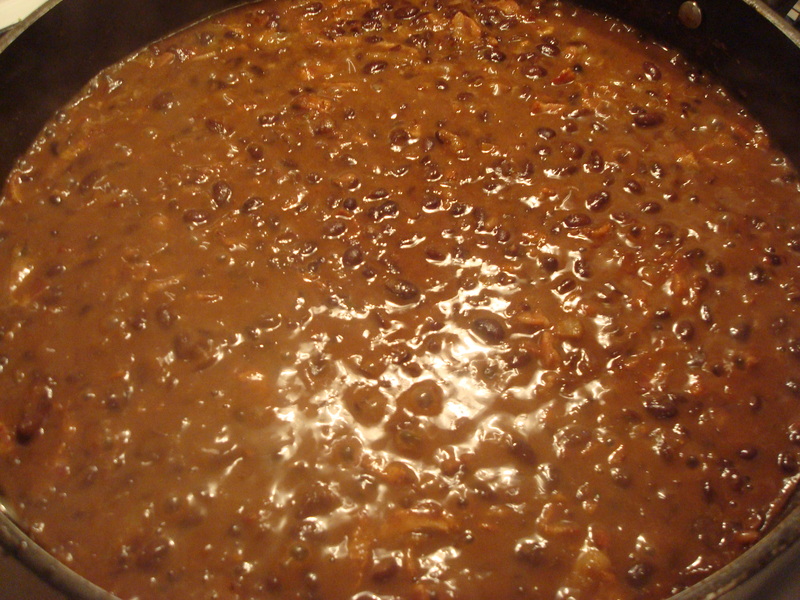 Allow it to come to a boil Using a fork mash some of the beans and mix them up with the bean mixture. Then add remaining ½ of chicken stock and allow it to boil down. Once the mixture is no longer soupy in appearance serve by spooning on top of a small portion of rice. Makes enough for dinner for two adults. 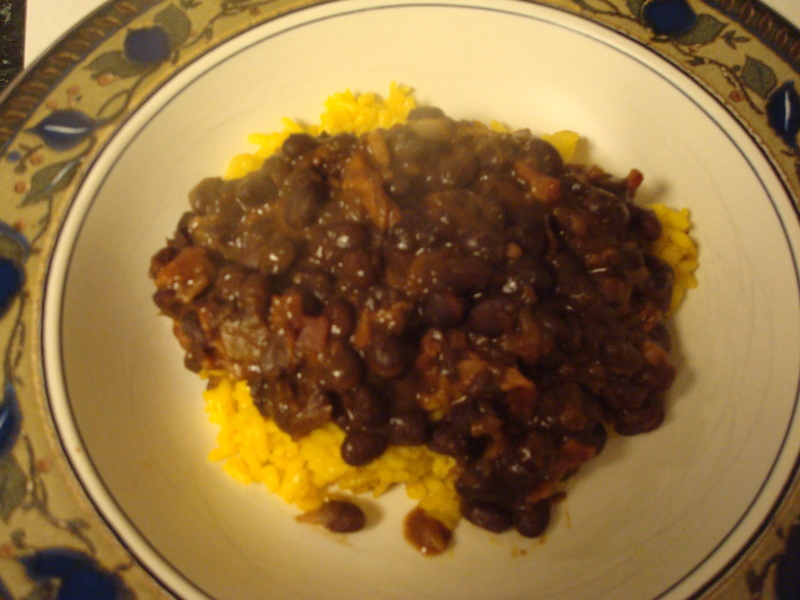 I love some good, hearty beans & rice (now if I could just get my daughter on board).